Baby Beach is a stunning and little-known destination, with a crescent of white sand and double coral reef. I'm crouched by the side of a road gathering sea parsley beneath the shade of a divi-divi tree. Legend has it that the parched soil around Frenchman's Pass is where Arawak Indians fought off French invaders in the 17th century. It's also where generations of locals have foraged for wild plants. I'm here with Maureen (Mauchi) Laaf Ras, a local farmer who is harvesting sea parsley to make her specialty smoothies at her food stall, located in Savaneta. The smoothies, along with fresh-squeezed juices, herbal teas and herbal medicine, feature foraged ingredients as well as moringa, kale and cucumber grown in the garden of her cunuku farmhouse. I bite a leaf and taste a burst of salty grassiness. Generations of locals have foraged for wild plants at Frenchmans Pass. "Trade winds blowing off the salt pans add a dusting of sea salt," she says, placing a handful into her basket. Foraging for wild botanicals might seem a strange thing to do on an island best known for its white sand beaches, casino hotels and glossy shopping arcades. But in Savaneta, the oldest town in Aruba, it's a tradition. This fishing village served as the island's capital when the Dutch resettled here in 1816, and although it's just 30 minutes away from the modern-day capital of Oranjestad, it has historically held little appeal for mainstream tourists. But that's changing. Aruba's southeast coast is popping up on the radar of travellers who want to experience the real Aruba. My home base is Aruba Ocean Villas, a collection of Tahitian-style bungalows that opened in November, 2016. Secreted behind a walled garden, these eco-chic overwater and beach villas were individually designed by owner Osyth Henriquez, a local artist and restaurateur. Aruba Ocean Villas is a collection of bungalows nested behind a walled garden. "I wanted to preserve the beautiful setting, yet express myself creatively," says Henriquez, who incorporates original artwork, antique crystal chandeliers and natural elements into the decor. My "Jojoli" villa, named after Henriquez's childhood friend, holds a king-sized bed, a soaking tub, a fridge and a wine cooler plus a living room beneath its soaring palapa roof. A wraparound deck extends the interior outdoors and, with waves lapping on all four sides, it feels as though I'm on a private island. Truth is, I can float to shore if I don't feel like walking down the wooden path. My explorations begin with an orientation tour. The first stop is at Benchi Fish Stand, where owner Benchi, a fisherman with a face weathered by sun and wind, is known to play impromptu tunes on his guitar for patrons who come to buy fresh-caught jampow, pikuda and robeki fish. Around the corner is Santo Largo Beach, a long stretch of pure white sand with clear blue waters. Other than a local family having a barbecue in the dunes, there's not a soul in sight. The next morning, after a breezy scrub in my outdoor shower featuring a conch-shell faucet, I sip a cup of coffee on my deck. It's surprisingly private, with mangroves on one side and pelican diving for fish on the other. Then I head south to San Nicolas to check out the once-booming oil-refinery town. It's impossible to miss the refinery. 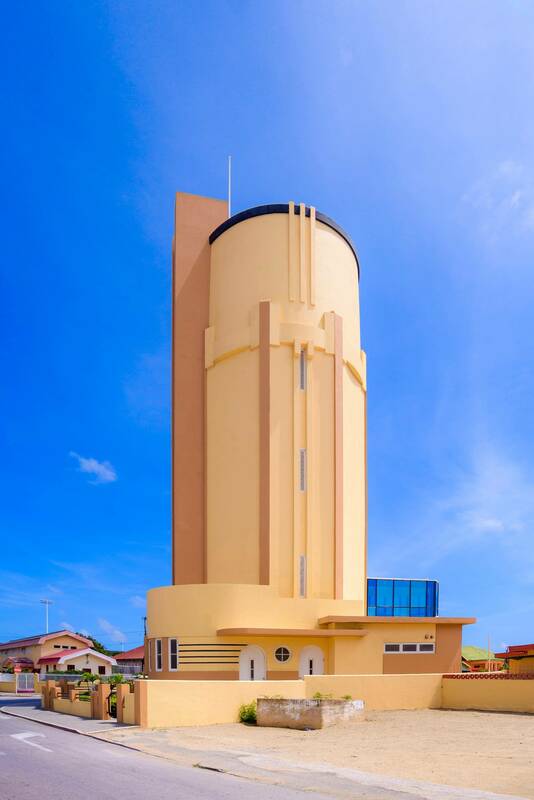 It operated from 1924 until 1985 and still stands, an imposing structure that symbolizes an era when San Nicolas was the boom town of Aruba's economy. Anchoring the district is Charlie's Bar, founded in 1941 and originally a hangout for refinery workers and sailors. Patrons are already at the original curved teak bar beneath a canopy of memorabilia. I spot a Popeye doll, an antique trumpet and what appears to be a set of false eyelashes dangling from the ceiling. "I don't let anyone stick any old thing up," says Charlie Brouns, the owner and grandson of the founder. "We're not a trashcan … everything has a story behind it." It's hard to determine his curatorial philosophy, so I sip my Boozer Colada, the bar's potent signature cocktail, and settle for tucking my business card on the wall. While San Nicolas's Main Street only really comes to life on Thursday nights with the Carubbian festival, a street party featuring food vendors, live music and Carnaval parades, new attractions are beginning to lure daytime visitors. And it's all about art. The Aruba Art Fair kicked off a burst of creativity that transformed this quarter into a canvas for local and international artists such as Chemis from Kazakhstan (now based in Czech), whose artwork reimagined the once-seedy Winter Garden Chinese Restaurant-Bar into a 3-D deck of playing cards. Other cultural attractions include galleries such as the Aritsa HQ showcasing works by young local artists and the Cosecha Creative Centre, where visitors can purchase artisan crafts certified by Aruba's Seyo National pa Artesania or participate in a workshop. Another draw is the new Museum of Industry, located within a restored water tower built in 1939. Its handsome Art Deco architecture wouldn't look out of place in Miami's South Beach district. Its exhibit cases are packed with fascinating displays on gold mining in the early 1800s, the history of aloe vera production and oil refining. Traces of the multicultural influences of these workers can be seen in Aruba's cuisine at O'Niel Caribbean Kitchen where I stop for lunch. The menu features a mix of Jamaican and Aruban dishes such as escovitch fish, garlic conco (conch) and balchi pisca (fish balls). Fish and chips feature Balashi beer batter, the local pilsner made from desalinated seawater. Further south along the coast is Baby Beach. Here, I sip a Monkey Juice signature drink at the Rum Reef Bar and Grill and then pop into the JADS Dive Centre, where instructor Sue Hieter has an innovative approach to combatting lionfish, the invasive species decimating the Caribbean's population of native fish. "I thought the bright fins would look beautiful within earrings, necklaces and bracelets," she says of her line of chic jewellery, proceeds of which go to support Aruba's threatened coral reefs. With its crescent of white sand, turquoise water and double coral reef, Baby Beach is a stunner. Yet the distant views of the oil refinery add an edge that keeps it from looking like a tourist brochure. On my final evening in Savaneta, I walk to the Flying Fishbone, a seafood restaurant where patrons can dine with bare feet in the sand and the ocean itself. From humble roots in 1997, it's become a glamorous spot drawing fans from Oranjestad's high-rise strip. I slide my feet into cool Caribbean waters and just as my cocktail arrives, a fisherman scrambles across a nearby rock and casts his line into the surf. Although Savaneta may be Aruba's next trendy destination, it's still a fishing village at heart. The writer was a guest of the Aruba Tourism Authority and Aruba Overwater Villas. They did not review or approve this article.